Relax, Refresh, Rejuvenate in unique and beautiful surroundings close to a range of activities and beauty spots at Hillcrest Retreat, multi Tourism Award Winning specialists in peaceful and romantic getaways for a Maximum of Only 3 Couples. Enjoy peace, privacy, spectacular views from Mount Warning to the rainforests of Springbrook Ranges and the Cougal Mountains, salt-water swimming pool, luxury double spa baths, split system a/c, fireplaces and a choice of one Honeymoon Spa Cottage in its own fenced rainforest garden, or 2 B&B Suites in a private guest wing of the main house. Perched atop a hill on 5 landscaped acres, surrounded by the rolling green hills of a 165 acre grazing farm with spectacular views in every direction, multi Tourism Award Winning Hillcrest is located in beautiful Upper Crystal Creek, just outside historic Murwillumbah in the Tweed Valley, Tropical Northern NSW. Just 35 minutes drive from Gold Coast airport, 80 minutes from Brisbane, 45 mins from Byron Bay and 12 mins from Murwillumbah CBD. Separate from the lounge you'll find a King Size Bedroom, with two double built-in robes, and a large ensuite bathroom with top of the range luxury double spa bath and separate shower, heater, hairdryer, robes, towels, pool towels, candles and a selection of toiletries. As well as a fully equipped kitchen with full size gas stove and microwave oven, fridge, toaster and all kitchen equipment; glass sliding doors from the lounge open to your private verandah where you’ll find your own gas BBQ, sun lounges and outside dining suite for alfresco dining. Tariff includes standard breakfast provisions including some of our famous crusty home-made bread and home-grown free range eggs, as well as firewood in winter. Full brunch basket and candle-lit dinners available by prior arrangement (at extra cost). 5 World Heritage Listed National Parks including Mt Warning. From the moment we got out of the car it was like stepping into another place, one of peace, beauty and relaxation. Paul and Craig greeted us like long lost friends. The Cottage was well appointed and has amazing views from every window. The food in the restaurant cooked by chef Paul was amazing. 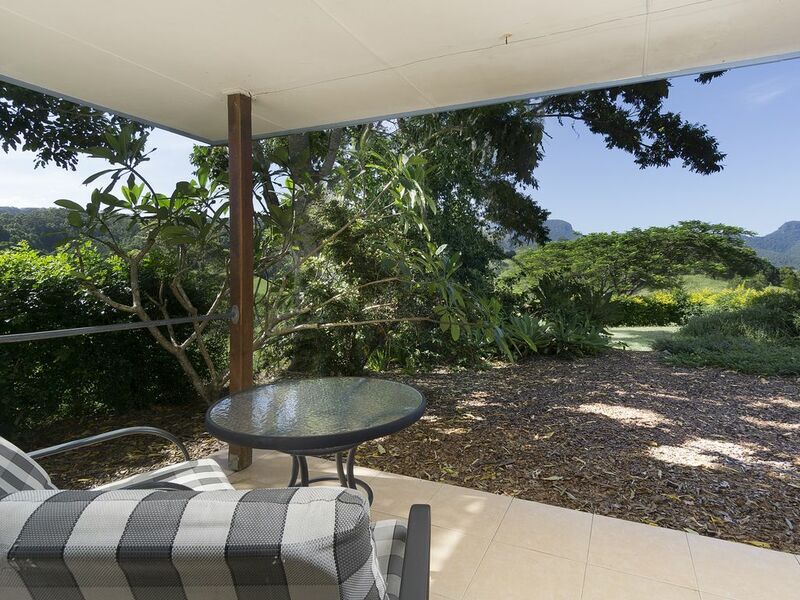 Perfect location, perfect hosts, perfect getaway quality retreat... from the thoughtful night caps to mouth watering breakfasts and unexpected bottle of fizz for NYE to enjoyable and pleasant conversations... a little of Queensland - beautiful one day, perfect the next! THANK YOU! Stunning location, charming hosts and beautiful, well equipped cottage. Stayed for 3 nights and it should have been longer - there's so much to see and do in the area but couldn't tear ourselves away from our peaceful oasis at Hillcrest. LOVED the mini ponies, the views, the pool - midnight swim highly recommended. All in all the most perfect romantic getaway and we can't wait to come back in winter to get that wood fire going!